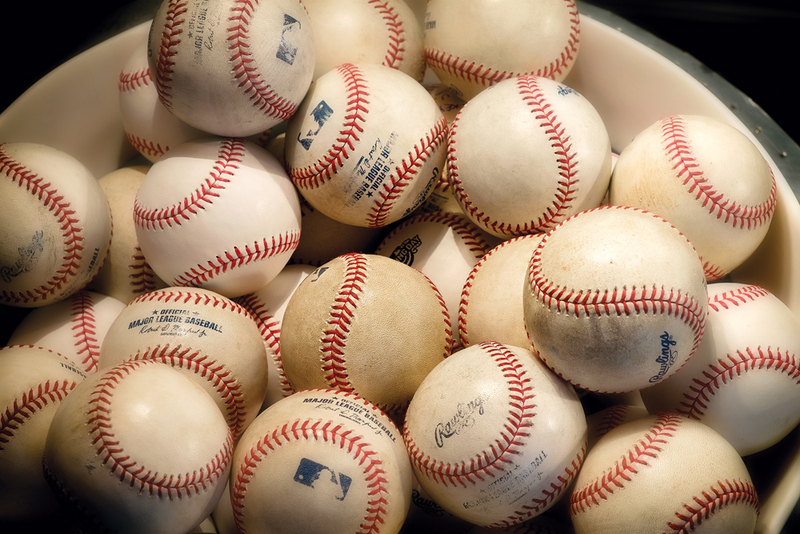 For Major League Baseball players and their families, hopping between airplanes, hotels, cities, and states for months on end is part of the job. Having a cozy home base is key to staying grounded. Pitcher Brad Hand was playing for the Miami Marlins when he made that haven in South Florida. 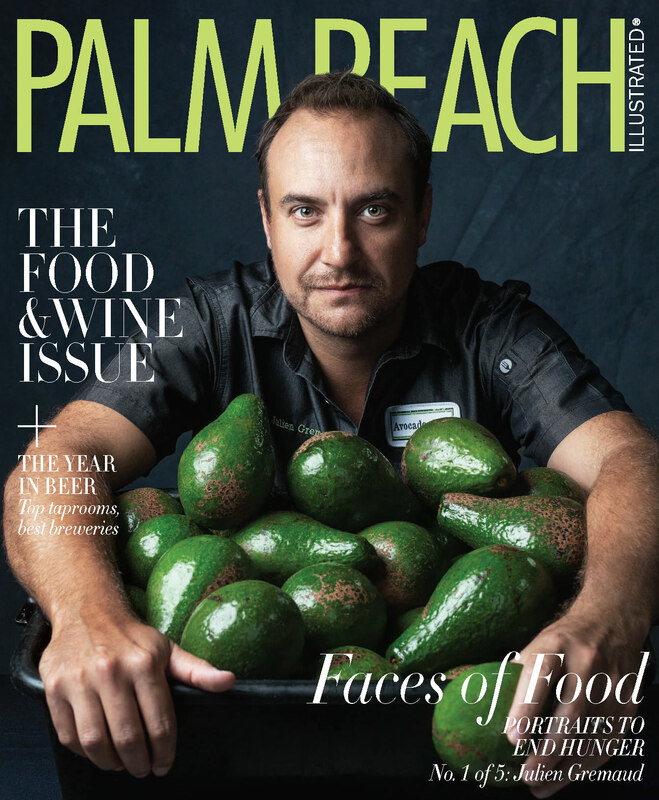 In 2015, he and his new wife, Morgan, purchased a home in Palm Beach Gardens before welcoming their baby girl, Lila, later that year. 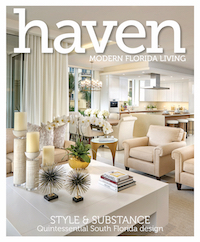 Despite their Miami ties, Brad and Morgan had sentimental reasons to house hunt in Palm Beach County. They met at the now-defunct Dr. Feelgood’s Rock Bar & Grill on Clematis Street in 2011. Four years later, they exchanged vows in front of a couple dozen guests at Palm Beach’s Café Via Flora. Beyond these romantic connotations, they ultimately selected their home for practical reasons. As it turned out, a major change would come before the couple could completely settle down. In April 2016, they faced a cross-country move when Brad joined the San Diego Padres. Rather than uproot altogether, the Hands chose to turn the Florida house they love into an off-season retreat. The Hands use the off-season months to catch up on family meals. “I love to cook and make everything from scratch,” Morgan says. 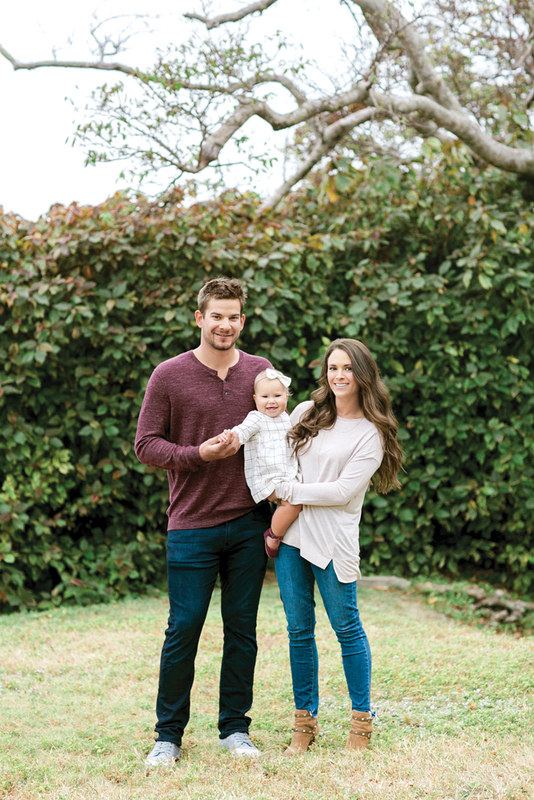 During the Padres’ most recent season, Brad and Morgan rented a two-bedroom apartment in San Diego’s Little Italy neighborhood. The rental was an easy decision, given its proximity to the stadium and good restaurants, but it never felt like home. When in Palm Beach Gardens, Brad and Morgan like to entertain friends and family, and they wanted their home to fit that lifestyle. 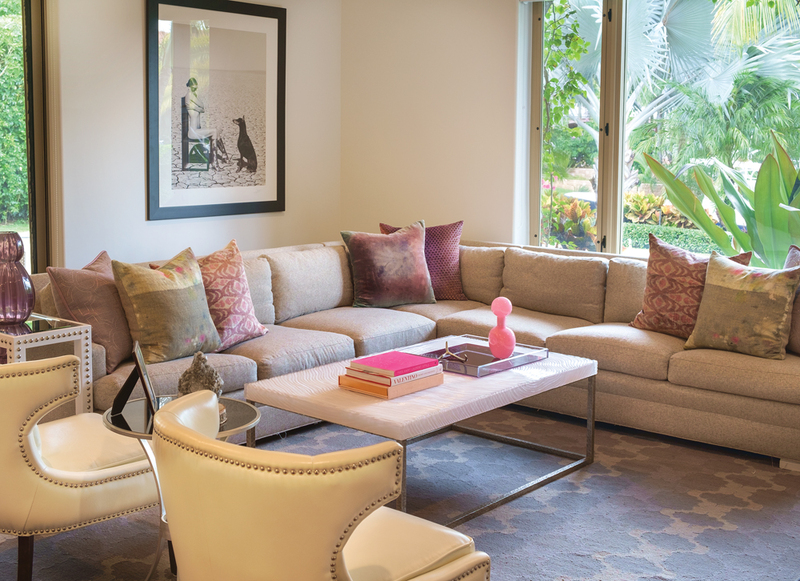 They turned to West Palm Beach–based interior designer Cindy West Ray of Cindy Ray Interiors Inc. to create a comfortable yet stylish sanctuary. Working mostly with Morgan while Brad was playing ball, Ray outfitted the home with furnishings, art, and accessories in a modern, neutral palette with subtle gold and metallic accents for sheen and texture. For Ray and the Hands, form wasn’t the sole factor to consider. Function had to play a part, as well, given the couple’s young daughter and the frequency with which they host guests. When in Florida during the off-season, the couple makes up for that lost time by grilling in their waterfront backyard (Morgan claims Brad is an excellent grill master) and hosting “Sunday Fun-Day” festivities for their close-knit circle of friends. 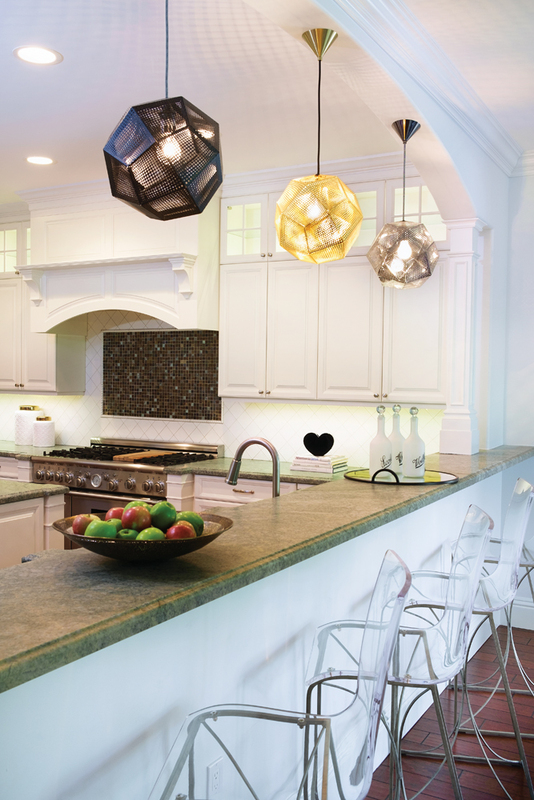 Whether entertaining friends or simply being together as a family of three, the Hands wanted their home’s interior to be as fun as the backyard. Right off the bat, Ray determined that the cavernous, double-height living room needed to be reined in to establish a cozier ambiance. “When I walked in the door, I thought, ‘We’ve got to do something to bring [the height of] this room down,’” she says. To create the illusion of a more horizontal and, in turn, intimate space, Ray installed a midcentury modern chandelier with brass arms and glass globes, dropping it low into the seating area. “I wanted to fool the eye,” she says. To enhance this trompe l’oeil, she positioned two identical gray velvet sofas and a matching pair of narrow, rectangular coffee tables face-to-face—a technique she describes as mirror-image seating—to dilute the room’s height and build a sense of width. Accessories, including lavender ottomans and oversized, abstract art prints, lend a glamorous appeal. 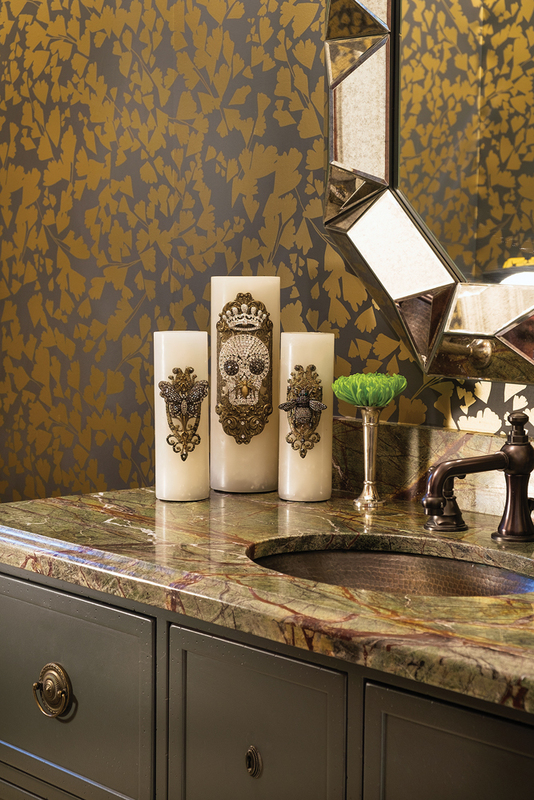 In addition to pearl pieces, golden hues appear throughout, most notably in a custom wallpaper used to spruce up a powder room. A local artist hand-screened gold-leaf flowers atop a charcoal background, resulting in a one-of-a-kind creation. “I fainted for this paper,” says Ray. Given the home’s arguably feminine aesthetic, the need to provide Brad with a more masculine escape was not overlooked. While Brad was playing baseball, Morgan worked with Ray to convert an extra bedroom into what Ray teasingly calls a man cave. There, Brad displays framed jerseys he brought along from his one-time bachelor pad. Regardless of the room, the Hands love hosting holiday festivities and gatherings for visitors, including Morgan’s mom, who lives in Savannah; her dad, who lives in Ponte Vedra; and Brad’s family, who are from Minnesota. “We live in such a destination town, everyone loves to visit,” Morgan says. Designer Cindy West Ray stresses the importance of striking a balance between beauty and livability. While some rooms ooze style, others, like Brad’s man cave, are all about comfort. 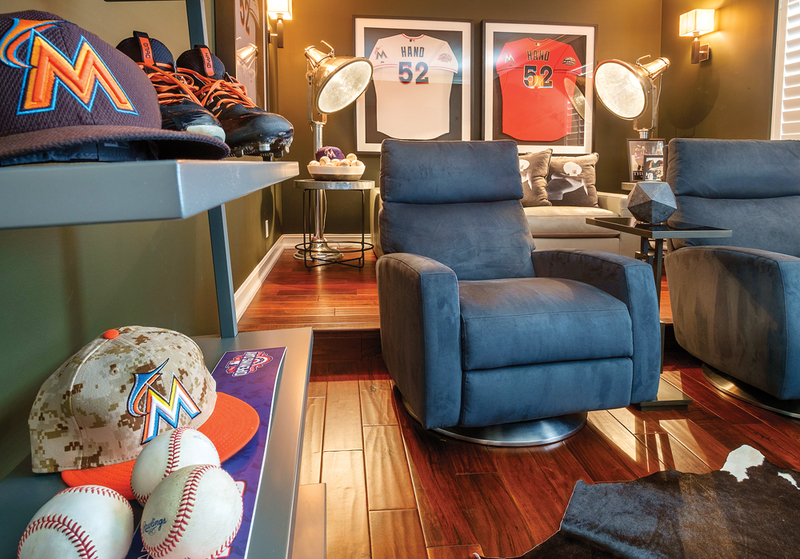 This space is decked with durable furniture in welcoming fabrics and memorabilia from his professional baseball career.